If anything has been made clear in the process of seizing and utilising Barclays neglected branch in Preston Circus, Brighton, it is the importance, power, and politics of space. A group once scattered across a variety of projects, movements, and positionalities – dislocated and fractured from one another, aspiring for more; hopeful, disillusioned, angry, loving, exasperated, enlivened, bored, curious, and excited – came together through the indispensably important reclamation and subversion of a space symbolic of the dominance and power of finance capital. We formed strong relationships rapidly through collective experiences of creation, expression, resistance, defence, and exertion. These relationships formed the basis for vast networks of ideas, skills, and resources – quickly put to work in establishing a squatted social centre to host radical political discussion, film screenings, workshops, skill shares, food redistribution, and to serve as a base for further organisation. Our eviction was expected, but was nonetheless rapid and accompanied by a dastardly PR response; the day after our court case Barclays and a charity named ‘3space’ immediately announced their plans to allow ‘social enterprises, entrepreneurs and community groups’ to utilize the space for free. This is part of a wider project the pair have launched under the name ‘Hatch’ which supposedly aims to ‘provide for a unique combination of creative, social and community needs, helping more people get their business ideas off the ground. It will also be a central hub for local communities, hosting local events and meetings’ – this sounded somewhat familiar in a dislocated sense. 3space announced their partnership with Barclays in December 2014, having converted one former Branch in Oxford with plans for four more conversions over the course of 2015. 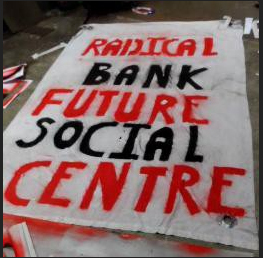 3space and Barclays claim the conversion of the Radical Bank branch had been planned for months, however the insidious timing of their press release, and a string of squat evictions prior to our own suggest this was a thinly veiled PR move. The building was secured to an extent that went far beyond anything seen before; wooden boards have been replaced with metal sheeting, an 8 foot spiked steel fence has been erected on the rear wall we used as a secured entrance, the cashpoint holes have been filled with concrete, and a 24 hour security team inhabit the building. Whilst the project has undoubtedly existed before us, the choice of building was clearly a tactical PR move intended to appropriate the discourse our movement had been using to critique Barclays. Our overwhelming levels of public support were shining a light on the abuses of capital, empty space, and processes of gentrification Barclays profits from, whilst calling the character of their organisation into question. The appropriation by capital of discourses crafted by grassroots movements is a common tactic to empty radical ideas of all substantive content and subvert them to serve the ends of capital accumulation and profit. Using similar terms such as ‘social’ and ‘community’ masks an elimination of those elements which challenge business as usual. This partnership also presents an image of Barclays as a benevolent community presence – masking its utterly destructive nature as a global force of finance capital; Barclays is the largest global investor in the arms trade and is the market maker for arms company ITT Exelis, they are also the named shareholder in several major arms firms including Raytheon, Boeing, and Lockheed Martin’. They utilised customers’ money to finance the weapons industry, including the sale of cluster bombs which kill and maim innocent civilians. They are the British bank with the most substantial investments in Israeli companies, including those based in Israeli settlements, and traded in shares of drones that killed over 1000 Palestinians. They supported the Apartheid regime in South Africa, only ceasing under immense economic pressure and heavy losses. They have promoted tax havens for companies investing in Africa, (meanwhile their own tax avoidance division generates them £1bn a year) as well as financing Mugabe and land grabs in a number of African nations, and speculated on food prices contributing to recent food crises. They were also implicated in dark pool fraud during the libor scandal. Barclay’s activities decimate communities globally, to present them as a positive community force is at best Eurocentric and more realistically an utter deception: intentional, calculated, and profitable. Partnership with such an organisation in this way throws considerable doubt on the integrity and intentions of 3space. 3space also claims to be a catalyst for ‘regeneration’ a major buzzword for anyone familiar with processes of gentrification (the redevelopment of deprived areas which intentionally raises the prices of property, rent, and services to drive out poorer populations – often from city centres – and replace them with more affluent individuals, investors, and businesses). Their funding comes entirely from a sister company ‘3space trading limited’ dealing in property management, linked to a mutual company ‘Frederick Building Management Company Limited’ – this charity has vested interests in rising property values. By occupying Barclay’s property, 3space prevents seizure of space for the needs of the deprived and the formation of radical political resistance. It instead hands it over to the aspiring petty bourgeoisie, giving itself and Barclay’s discretion on who uses the space and how. Barclays are able to give loans to them, presenting an investment opportunity that simultaneously protects the investment of the landlord in his property. Once Barclays or the landlord require their property back, 3space hand it over having contributed to gentrification in the area which will have led to the value of the property to rise – a win for capital. Despite all of this however, in 12 days a rag tag group of 20 or so people had achieved more than any A to B march I can recall – because we took direct action which awarded us the space to make those achievements. We reached and engaged with tens of thousands of people online, and hundreds in the space itself and the street outside. Our first open day saw over 500 people through our doors in 6 hours. We got to know one another, forming networks of resources, skills, ideas, and friendships – networks which remain available to us beyond the space. We fed hungry people, opened a place of shelter for some, and attacked the dominant and derogatory image of squatting. We got sustained media coverage and a PR response from one of the largest banking corporations in the world. We demonstrated to others that despite the gentrification and de-politicisation Brighton has suffered in recent years, radical forces remain, will resurface, and want your help. We highlighted problems of empty space, deprivation, homelessness, gentrification, hunger, food waste, debt, capitalism, private property, the state, and more. We grew as individuals and as a collective, developing meaningful relationships, skills, and knowledge, whilst experiencing autonomy, systemic injustice, and empowerment. 2 and a half years of organising demonstrations among students in Brighton had come nowhere close to the impact that this action had. The inefficacy of A to B marches was succinctly demonstrated on Saturday 20th June, just one day after our eviction. Somewhere between 150,000-250,000 people marched against austerity in London. Police hid like alley rats snaking overtly between buildings and covertly among crowds, tasked with infiltration, sabotage, and disguising an enormous presence ready pounce on the slightest deviation from the sanctioned ritual elements of the A to B; the bureaucratic, top down nature of its organisation meant that we were herded like cattle away from the corridors of financial capital, to the parliamentary husk controlled by its power, whilst all potential for significant direct action was expertly suppressed; moderate groups and so called movement leaders dominated, and were awarded an egoistic platform to preach to the converted in a manner which undersold the social, environmental, economic, and political genocide that is global neoliberal capitalism; the next day, the neoliberal elite stated their intention to proceed with their project regardless of those numbers in the street. This is not to attack or deride those who attended, but to cry out for more than a castrated and controlled mumble of discontent. This neoliberal government does not act from a democratic mandate; when 36.9% of the vote constitutes a majority for radical decimations leveraged upon the unprivileged masses, we are looking at a rigged system. This government and its partners in capital do not respond to the concerns of the demos, they make only tactical concessions to continue their assault unhindered. We should not expect passive and highly controlled public demonstrations of discontent to alter their course, it is direct action and true reclamations of power which garner responses – whatever those may be. The march posed no threat because space and time were controlled, the route predestined, compliance ensured by crowd control, and an end point in sight. We all left by the end of the day, having achieved little more than traffic disruption, and with no intention to repeat the ritual until November. Those in power remain in those spaces day and night, orchestrating social, political, environmental, and economic genocides from green, red, and black seats – when we leave, we leave them to it. It is the continued presence of bodies in spaces that facilitates action and challenges power, to stand up and refuse to go home, to locate ourselves in the corridors of power, to seize their capital where empty buildings are left to rot, and engage in sustained disruption of their daily activities. The seizure of space gives us power, it allows us to relate, create, and resist collectively; to pool our skills, resources, and ideas; to feel and express true solidarity; to obstruct; to experience democracy; to act as one; to escape isolation and know those who stand beside us; to claim the right to the city. The potency of occupying space does not go unnoticed, it is subjected to surveillance and undercover policing, physical and legislative repression, and vicious denigrations by the right wing press, whilst spaces in the city themselves are increasingly securitized and controlled. This is why squatting is partially outlawed and repeatedly attacked in the courts and the press. It is why following on from the London manifestation of the Occupy movement the possession of tents, sleeping bags, tarpaulin and the occupation of public space for a sustained period have been made illegal – whilst the movement itself was categorised as ‘domestic extremism’. It is why Parliament Square – an historical hub of political resistance, adorned with token statues of Nelson Mandela and Gandhi which are used to perpetuate historical erasure and national myths – has recently been repeatedly fenced off by the Greater London Authority, a move intended to claim ownership and control of a site of great political significance with the result of preventing protest in that space. It is why we were evicted in 12 days accompanied by an insidiously clever PR response. What is important is to take these lessons forward; to continue to seize spaces, and create autonomous, horizontally organised, prefigurative alternatives. From here we may begin to resist capitalism and the state, and contest the right to the city. We must not allow ourselves to be co-opted by flaccid institutionalised forces or passive protest tactics. Instead we have and must continue to assert autonomy, acting collectively and directly to fight against the decimation of the planet and the poor by states, governments, and capital. We must confront these forces continuously with the presence of bodies and minds in both free and highly repressed spaces, working to improve ourselves, help others, and attack structural injustice in the present. In Britain we sit in the belly of the neoliberal beast – its soft spot is not far away. Otro mundo es posible, un mundo donde quepan todos ios mundos. This entry was posted on 30 July, 2015 in homepage and tagged 3space, African Nations, Apartheid, Boeing, Brighton, Gandhi, Lockheed Martin, occupation, Parliament Square, Preston Circus, Radical Bank.Barclays, Raytheon. Bookmark the permalink.